Low gas prices are creating a dilemma for auto makers. Federal regulations are requiring their fleets get better mileage every year, pushing them to produce an increasing number of hybrid, plug-in hybrid and electric vehicles. But gas prices are so low, most consumers aren't all that worried about mileage and are unwilling to pay the higher prices for cars with electric motors and batteries. Hyundai has approached the problem this year by greatly improving its only hybrid, the Sonata. For 2016, the midsize sedan now boast an EPA average 42 miles per gallon, a significant improvement over the previous 38. And a new plug-in version will go 27 miles on electricity alone before transitioning to hybrid power that switches between a 2.0-liter inline four cylinder engine and an electric motor, and uses both when more acceleration is required. But more than that, the 2016 Hyundai Sonata Hybrid is a really good car. Based on last year's redesigned version, it is quiet and stable on the road, and looks more expensive than its $26,000 entry level price, both inside and out. That's a few thousand more than the entry level non-hybrid version, there's more than just the price to think about. Over the past two years, Hyundai has toned down the flashy exterior and interior styling that first put their cars on the map. As a result, the current Sonata looks more grown up. With its larger front grill and optional leather interior, it might be mistaken for an Audi, at least at first glance. Although classified a midsize, the Sonata feels more like a full size car. It has an impressive amount of room in the front and even more in the back, where rear seat passengers will find plenty of head and leg room. And the trunk is enormous. Hyundai makes larger cars — the Genesis and Equus — but five passengers should be perfectly comfortable in the Sonata. Although some hybrids are slow and not much fun to drive, the Sonata drives like a traditional gas-only car. It has three drive modes activated by a button on the center console — Eco, Normal and Sport. Little is sacrificed in Eco, where acceleration is surprisingly normal, considering that's where it gets the best mileage. And the Sport mode actually makes the performance half-way sporty, especially for a car that's basically an affordable family sedan. 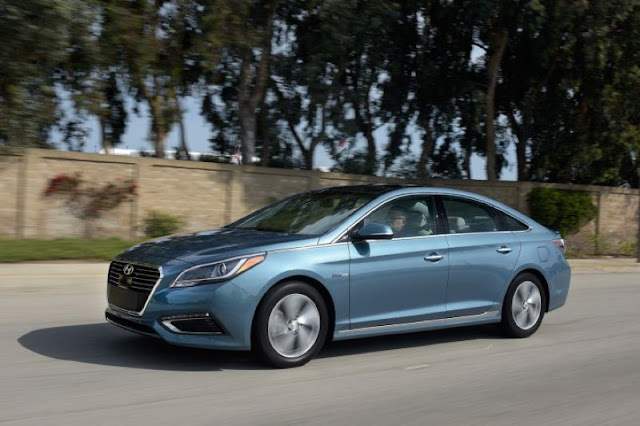 Hybrids may be a tough sell these days because of low gas prices, but the Sonata Hybrid offers plenty of reasons to consider it anyway. And if the past is any indication, gas prices will eventually go back up, making the EPA rating of over 40 miles per gallon even more attractive.